The LEGO Star Wars Anakin’s Fighter set is one of the best selling Star Wars Lego sets available for kids 7 years old and up. 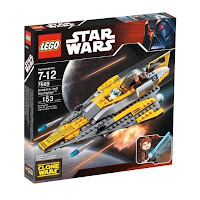 Includes over 150 pieces, kids will enjoy the process of building this Jedi Starfighter that is over 10 inches long! Includes R2-D2 and Anakin Skywalker figures.